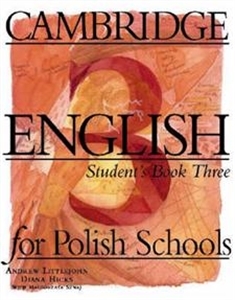 Cambridge English for Polish Schools is an exciting new approach to English, designed especially for classes 5-8 in regular primary school. The course offers: - an approach centred around the whole educational context of learning English at school - links across the school curriculum to other subject areas throughout the course - content and concepts related to learners' ages and levels of ability - an organisation which takes into account the realities of teaching English at school: mixed abilities, mixed motivation, time available, and class size - material which has been developed and successfully piloted in collaboration with teachers and classes in Poland - opportunities to link up with classes in other countries through the Parcel of English scheme The course consists of four levels. Level 3 is suitable for students who have studied at elementary level and takes students through to low- intermediate. All levels include bilingual Language summaries and word lists.